Out of all the real estate agents in the strong markets of Florida, what are you doing to distinguish yourself from the masses? Listing appointments, a common practice of the real estate agent, doesn’t have to be monotonous. Here are a few ways to help you stand out and ensure a closed deal during your next listing presentation. Because it is a job interview. Put your ego aside and come ready to present yourself truthfully and genuinely as the best person for this position – to help your client sell a house – and why. Don’t be afraid to talk about your achievements alongside of your responsibilities as their REALTOR®. And always be honest. Writer Kevin Hoover also mentions the importance of being truthful in an Inman article from January 2019. Finally, leave a physical copy of your resume along with your picture for them to remember you by. Whatever materials or resources you help ease a seller’s concerns or questions about the process, bring it. Fill a folder with simple checklists and articles to aid in their understanding of how the process is going to look. You don’t have to go over everything in the meeting as you don’t want it to be an overload of information. Let your clients take the folder home and use for future reference. And, of course, include your branding and contact information so that they can reach you when they’re ready to list. One of the most important characteristics of a great real estate agent is attention to detail. However, no one person can remember everything. Taking notes is crucial at the listing appointment. Before you begin writing, be sure to ask for permission. You want to ensure that your potential clients are aware and comfortable with their words being recorded. Most people will say yes, however, it’s important to build that trust, especially on the first meeting. Also, use a physical notepad and pen, rather than typing on your laptop or cell phone. While using your laptop or cell phone isn’t necessarily wrong, you may come across as closed-off and disengaged. When you come back around at the end of the transaction and refer to something they said in your listing presentation, your clients won’t be able to hide their gratitude for your memory. In accordance with taking notes is getting to know your clients. You want to ask them detailed and specific questions about their likes, dislikes, family, and what they’re looking for in a real estate agent. Write down their answers. If the deal is sealed, so to speak, ask for their birthday, anniversary, and kids’ birthdays in order to stay in touch with them throughout the year and long after their house is sold. As they say, a hand-written card goes a long way. A day or two after the meeting, be sure to write a card thanking them for their time and attention. Mention something in the card that was specific to your conversation. Not only will it remind them a few days later of your services, it adds the perfect professional touch and will showcase your attention to detail. There are other ways to say thank you besides just a card. You can include a gift card, a branded item such as a pen or keychain, or anything else that will help the client remember you. 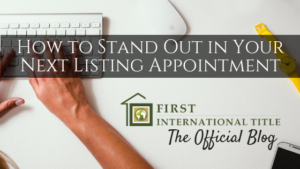 All of us at First International Title desire to see our real estate partners succeed, which is why we have many resources and flyers to help real estate agents and loan officers with their business. Reach out to your local sales executive to gain access to our many tools available for you to stand out in your market! « How to do Pop-Bys Like a Pro!